The Intersections & Beyond: Amway's Nutrilite Health & Wellness Expo at Market! Market! Amway's Nutrilite Health & Wellness Expo at Market! Market! In the fast paced life we live, we may forget what is really important to be able to enjoy life as it should be. We can live right by being healthy and fit, living life with zest, security and self-confidence. How do we achieve this? 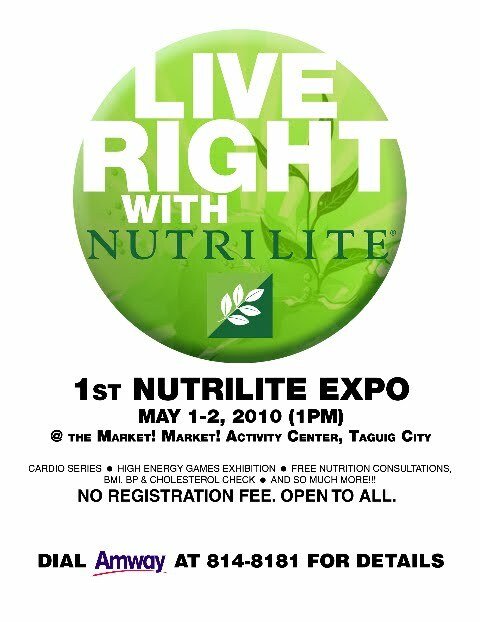 Nutrilite, the world’s leading brand of vitamin, mineral and dietary supplements, shows the way to a life full of energy through its Nutrilite Health and Wellness Expo on May 1 and 2, 2010, starting at 1:00 pm at the Market! Market! Activity Center, Fort Bonifacio Global City, Taguig City. Entrance to the Nutrilite Expo is free. At the Health and Wellness Expo, Nutrilite will give consumers the opportunity to learn new and effective ways to stay healthy and energetic. There will be two activity zones, the Energy Zone for high-energy exercises and games, and the Live Right zone for living and eating right for energy. At the Energy Zone, there will be a 45-min Cardio Series that will precede the demonstration of high-energy exercises and games. Plyometrics, Cardio Hiphop, Circuit Training and Yogilates will be among the new exercises to be demonstrated by fitness experts. These fitness exercises are designed as compact, fast paced effective ways to burn calories, perfect for people on the go. High-energy exhibition games for badminton, futsal and ultimate Frisbee will also be demonstrated by leading athletes. 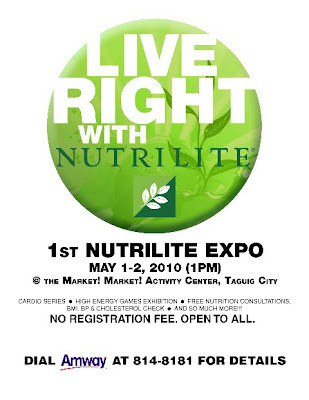 For the Live Right Zone, there will be Nutrilite product booths to give Expo guests the chance to learn about Nutrilite products, as well as opportunities to learn about business options for their distribution. There will be a free nutrition consultation booth, a BMI reading and cholesterol-testing booth. Guests can also take a stab at playing Wii fitness games. And to give Nutrilite Expo guests a souvenir of their visit, a photo booth with a giant trampoline will be installed to capture an energetic mount of daring guests. So plan a visit to Nutrilite Health and Wellness Expo with your family! It’s the energy boost that you’ve been waiting for. Nutrilite is the only global vitamin and mineral brand to grow, harvest and process plants on its own certified organic farms. Nutrilite products provide energy and zest for life.